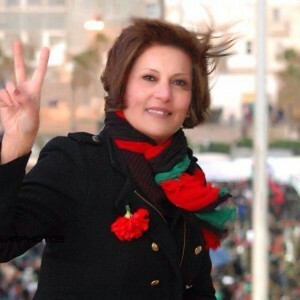 This weekend we pay tribute to the life of Libyan human rights defender Salwa Bugaighis. A lawyer, politician and activist, Salwa was a key figure in Libya’s recent history, first in the Benghazi protests that led to the revolution and then in the early stages of democratization. In an act that became symbolic of Libya’s faltering transition and fall into chaos, Salwa was assassinated on 25 June 2014, having returned home from casting her vote in the general election. Weeks later, former member of parliament Fariha al-Barkawi was also assassinated by gunmen, and the murder of civil society activist Intisar Al-Hasiri followed soon after. In the three years that have followed no one has been prosecuted for the murders of Salwa, Fariha and Intisar. The prospect of peaceful, just and democratic Libya seems ever more distant. Compelling, credible, and firmly rooted in the community they sought to change, Salwa, Fariha, Intisar and activists like them are the greatest hope the world has for peace and justice. When killers and criminals can harass, attack and even murder human rights defenders with impunity, there is no justice, no peace, no democracy. The international community has a duty to protect human rights defenders. Violent groups silenced the voices of Salwa, Fariha, Intisar and many more brave human rights defenders across the world. But they cannot silence their message of hope, nor erase the example they have left for the activists they continue to inspire. We call on governments and civil society to push for strong, independent investigation after every attack and murder committed against human rights defenders. We ask UN member states to support the investigation of the International Criminal Court Prosecutor into crimes in Libya since 2011. This investigation must include acts of political violence. We seek justice for Salwa, Fariha, Intisar and all human rights defenders who have been victims of violence; justice for human rights defenders is justice for all.